How many questions about Awesome Animals can you ask and answer in just 48 pages? If you're the editors of Time for Kids, you can squeeze a whole lotta information in those few pages. And the best part? What's in those pages is really, really interesting. The first half of this book deals with all sorts of animals, both wild and domesticated. In fact, that's one of the 250 facts in this book - the reason why some animals are domesticated. 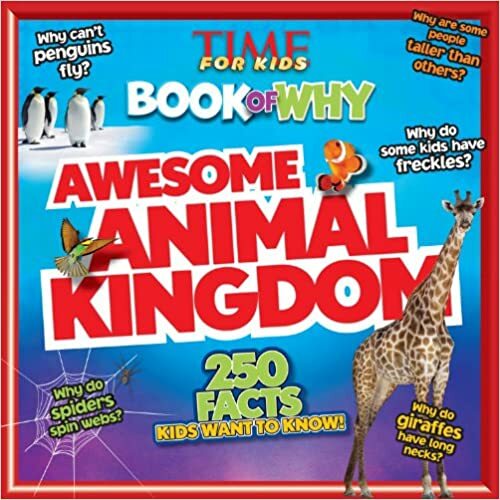 Other animals/topics include such things as why penguins can't fly, why cats always land on their feet, and why birds fly south for the winter. The second half of Awesome Animal Kingdom focuses on the animal we all know best ... humans! There are so many interesting facts packed into this little book that it's hard to choose what to mention. Do you know why people go bald? Why we cry? Why we produce saliva? You will after you read this book. How about why people have earwax? Why do some people have curly hair? Why do knuckles crack? These questions, and their answers, are just a small sample of what you'll find in this wonderful book. The layout of this book is very appealing, with abundant bright, colorful photos and easy to read text. More difficult words are highlighted with bold and defined in the glossary in the back of the book. While no topic is discussed in detail, there is enough per topic to grab a child's attention and lead to further research. Quill says: Every classroom and homeschool should have a copy of this book and the others in the series. They make learning fun!